I read this verse to the youth girls at church a while ago and I really love the simplicity of the verses words and how from there you can really dig deep into what it’s saying to you as an individual. Thats one of the things I love about scripture, one verse can talk to you in many different ways. I really felt that this scripture is saying no matter what season we are in, in our lives we need those things in our wardrobe, compassion, kindness, humility, quiet strength, forgiveness and love, well love is a necessity something we have to have regardless, almost like a pair of knickers or a bra, we shouldn’t leave the house without it and we should wear it everyday. Often clothes are an indication of our personality, baggy jeans, surf clothes, high heels, business suits etc so what we wear will show whose we are and who we serve. I also love at the top of the scripture the words “dress in the wardrobe God picked out for you” It’s saying that we need to dress in the staple garments but I feel we all wear those garments differently and with that God has chosen our wardrobe, God made us as individuals, he chose how he wants us to dress each day. Wear what God chose for you and not what he chose for someone else. Because we have been Chosen, let these words transform your thinking and motivate what you wear each day. Don’t leave home in someone else’s clothes this week, dress in the wardrobe God picked out for you. 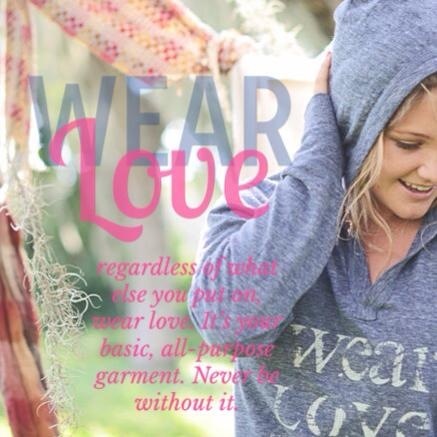 And regardless of what else you put on, wear love. It’s your basic, all-purpose garment. Never be without it.